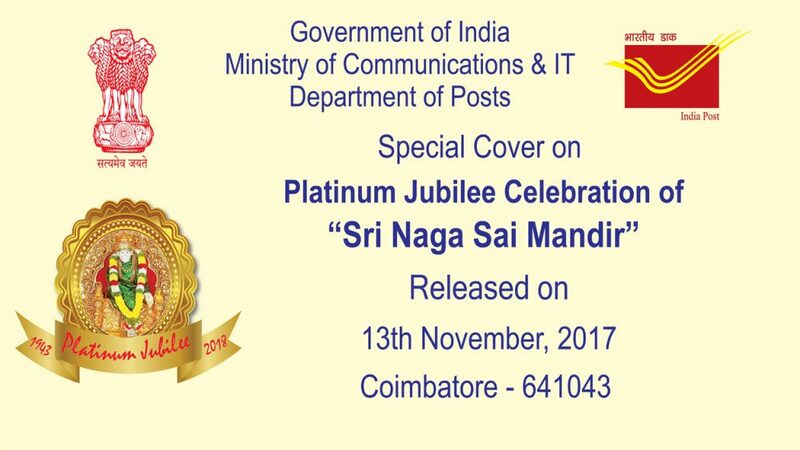 Indian postal ‘Special Cover’ was released with Postal Special Cancellation to commemorate the Sri Naga Sai Mandir platinum jubilee(1943-2018) on the arrival of the Holy Paduka of the Saint of Shirdi Saibaba(12th and 13th Nov 2017). 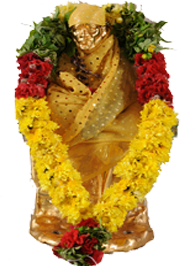 The cover carries a Sri Naga Sai Mandir platinum jubilee logo and temple photograph. The special Indian Postal cover was released on 13th-October-2017 Coimbatore. A Special Cover was released by Mrs. Sharda Sampath I.P.S Postmaster General Western Region first copy recived by S.Lakshmi I.P.S (Law and Order) Deputy Commissioner Of Police Coimbatore, P.Perumal I.P.S Deputy Commissioner of Police(Crime) on the behalf of Shri Saibaba Sansthan Trust,Shirdi Shri. Ashok Auti Administrative Officer, Shri. Madhukar Gangawane, Security Officer, Shri. Pandrinat Shekde and main coordinator Paduka Darshan Shtabdi cell and Sri Naga Sai Trust Sri. S.Balasurbramnian B.Com., Vice President, Sri. S.Balasubramanian BA,.BL., Secretary, Dr. N.Sarvothamman M.B.B.S, Treasurer in presence of devotees, Coimbatore on 13th-November-2017. Hence Indian postal ‘Special Cover’ considered very valuable by collectors. 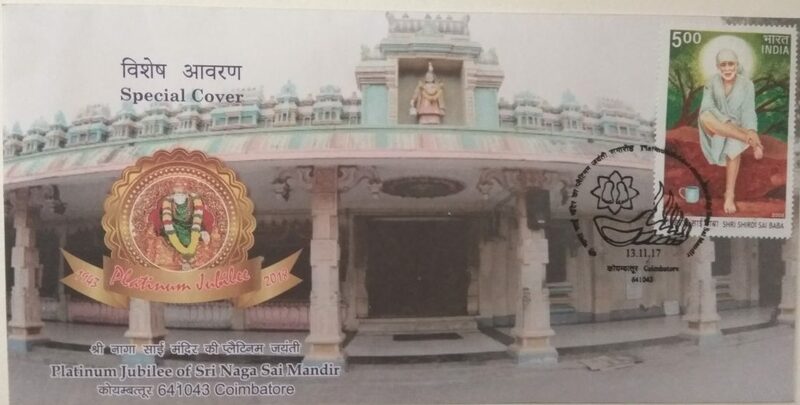 The Indian Postal department’s Sri Naga Sai Mandir platinum jubilee Special Cover priced at Rs 20 and It is available at the all the Head Post Office and also on India Post official website www.indiapost.gov.in.